Urban Tellers show at the Fremont Theater. This is your invitation to be a part of a unique opportunity that Portland Story Theater is offering to the refugee and immigrant community. Portland Story Theater is thrilled to be creating a very special edition of Urban Tellers®, featuring the stories of people from the refugee and immigrant community in Portland, Oregon. We have won a grant from the Oregon Cultural Trust which will enable us to make this dream a reality. Since 2004, Portland Story Theater (PST)’s mission has been to build community and promote understanding by giving voice to the true stories of ordinary people. Through our workshops and performances, we teach ordinary people how to craft and tell their personal narratives. Urban Tellers ® Refugee Edition will allow members of Portland’s refugee community to identify, develop and perform their own true stories as part of our regular season. Urban Tellers® is our monthly show featuring the true, personal stories of the people of Portland, told eye-to eye, face-to-face, and heart-to-heart. No notes, no props, no costumes; just the teller, the audience and the words. The stories are told before a live audience and are also recorded and uploaded to our YouTube and podcast channels. We want to invite refugees and immigrants to participate in our Art of Personal Narrative workshop, culminating in an Urban Tellers® show. There is no pre-set theme. You certainly may tell the story of your experience as a refugee and your journey to Portland, if you like, but you are not required to do so. Our purpose is not to set refugees and immigrants apart as a separate segment of society; our purpose is to show that refugees and immigrants are ordinary people, like everyone else, with the same hopes and dreams and feelings. Through our personal stories, we strive to show that we are all one family, sharing the human experience. There is no us and them; only us. For that reason, you are free to tell a story about anything you like, as long as it has meaning for you and is a true, personal story. A theme that ties all the stories together will emerge organically within the group as the stories develop and take shape. There is no writing. All the stories will be developed and told orally, from the heart, not from a written script. The increasingly acerbic, anti-immigrant language of the current political season has convinced us that now is a perfect time to celebrate and support refugees and immigrants by hearing their stories. These narratives will enrich our community by helping them realize the humanity we share with our refugee and immigrant neighbors. It will further our vision of “changing the world, one story at a time.” The storytellers will feel empowered and validated by having their stories heard by a receptive, appreciative audience. We anticipate that this will be a very healing experience (as it so often is for our Urban Tellers participants). Likewise the audience, many of whom will be family or friends of our tellers, will gain access to an art form they may not have experienced. Regular audience members will gain compassion by hearing the true, heartfelt stories from the refugee and immigrants community. The process is likely to be transformative for tellers and audience alike. This project directly supports our mission of building community by giving voice to the true stories of ordinary people. We have wanted to work with the refugee community for several years, but have been unable to access that community on our own. A recent partnership with Catholic Charities has helped bring the project to reality. No experience is necessary but if you attend one of our shows on a first Friday, you will gain a clear understanding of what the experience is like. Contact us directly if you would like to attend and we can provide you with free admission. We would like to meet with everyone who is interested in being a part of Urban Tellers ® Refugee Edition. The sessions are held in the home studio of Portland Story Theater in NE Portland near 15th and Fremont. 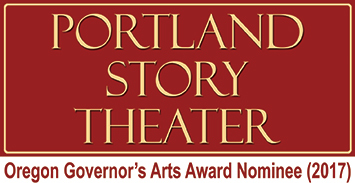 Portland Story Theater’s experienced facilitators will guide you through the process every step of the way, helping you to identify the story that you most need to tell and shape it into a story that you can share with your family, friends and community. Sessions are in the evenings 7pm to 10:30 pm. The workshop/show is limited to six participants. There is a time commitment. It is important that you are able to attend all the sessions. There will be no cost to you for your participation in this unique workshop and performance process. Thanks to the generosity of the Oregon Cultural Trust, the usual workshop fee will be waived. We do have budget for an interpreter should you need one. We also have budget to cover the cost of public transportation for those who may need it. To get a flavor of the stories that are typically told at an Urban Tellers® show, visit our YouTube channel. If you’re interested, please let us know by emailing us at tellers@pdxstorytheater.org or calling us at 503-284-2226. Thanks! We are looking forward to hearing from you.